Agilent Technologies have announced the U2741A USB modular digital multimeter (DMM). The 5.5-digit U2741A modular digital multimeter is the latest member of Agilent Technologies’ USB modular instruments family. These compact instruments make it possible to carry two or three pieces of powerful test equipment in a briefcase alongside a laptop PC. The U2741A modular digital multimeter offers fast, 100 Sa/s measurements and maximum input levels of 300 Vdc and 2 A. It provides a broad range of essential features and 10 measurement functions: DC voltage and DC current; RMS AC voltage and AC current; two- and four-wire resistance; frequency; diode test; continuity; and temperature. The bundled Agilent Measurement Manager software provides a familiar user interface on a laptop or desktop PC. According to Ee Huei Sin, Vice President and General Manager Agilent Technologies Basic Instruments Division, the U2741A modular digital multimeter enhances the solution for engineers who are called to troubleshoot problems with electronic products and processes. Whether they are being used at a customer site, an outsourced manufacturing facility or elsewhere, Agilent Technologies’ USB modular instruments give engineers the flexibility to arrange and rearrange test configurations to fit changing needs. The modular digital multimeter uses standard, high-speed USB 2.0 for plug-and-play connectivity. The included IVI drivers allow users to programme with Agilent VEE, MATLAB, C#, C++, Microsoft Visual Basic or LabVIEW. The U2741A modular digital multimeter joins the U2701A (100 MHz) and U2702A (200 MHz) two-channel oscilloscopes; the U2761A one-channel function generator with arbitrary waveform capability; the U2722A source/measure unit; and the U2751A switch matrix. 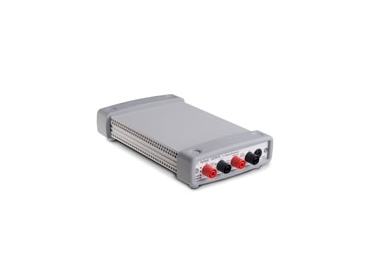 All can be used as standalone devices or when mounted in the six-slot U2781A chassis. The chassis allows hot swapping of modules even when powered up. The chassis also supports Agilent Technologies’ line of USB data acquisition (DAQ) devices, which includes U2600A digital input/output modules, U2300A multi-function DAQ modules and U2500A simultaneous-sampling DAQ modules. These can be used alongside the USB modular instruments within the chassis.